UNITED NATIONS, June 9 2016 – The New York Public Library, usually a place of peace and quiet, was amplified with the voices of global leaders and activists at The Global Mayors’ Meeting on Ending AIDS in Cities on Monday June 6. 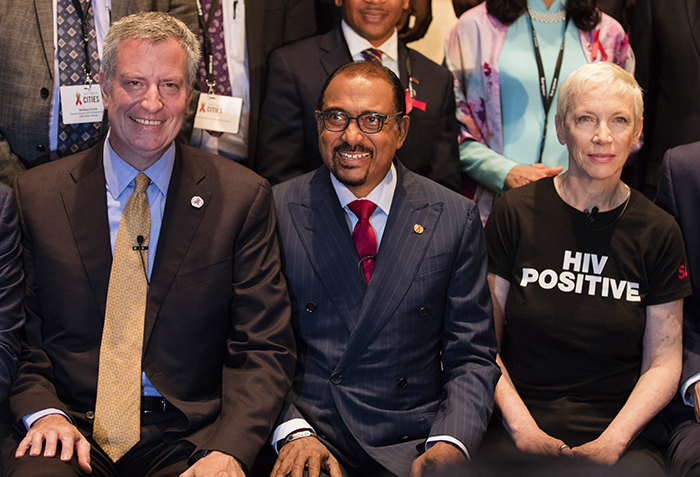 As 80% of those with HIV AIDS live in cities, around 30 mayors of the world’s major cities sat in one room yesterday to grasp their crucial role in ending AIDS with UNAIDS and UN-Habitat. “Cities are centers of innovation. Cities are centers of business. Cities are centers of vibrancy.” said Joan Clos, Executive Director of UN Habitat. The cities meeting was held in hopes that the action of cities will raise the bar for national governments, in time for the UN General Assembly High Level Meeting on ending AIDS June 8-10, where member states will work towards a political declaration putting the world on course for achieving the UNAIDS Fast-Track targets by 2020, and ending the AIDS epidemic by 2030. “It is so incumbent on all of us in cities to set the pace for the world”, said New York City Mayor, Bill de Blasio, the host of the cities event. “We in cities have become used to taking responsibilities for larger problems. We are never surprised when a national government may be somewhat slower to act.” said de Blasio in his opening speech. 200 mayors have already signed the Paris Declaration committing to UNAIDS 90-90-90 targets: by 2020, 90% of people with HIV will know their status, 90% will know their status on an antiretrovial treatment, and 90% of people will be on treatment with suppressed viral loads. New York City sets good example for these global goals. More than 90% of at-risk New Yorkers know their HIV status. De Blasio says New York’s commitment to the people is that if they are HIV positive, they will be treated, no matter what challenges they have. In 2015, although 36.7 million people globally were living with HIV, only 17 million were accessing antiretroviral therapy. UNAIDS estimates that $26.2 billion will be required for the AIDS response in 2020. Other renowned participants and attendees included Annie Lennox, UNAIDS Goodwill Ambassador, singer and social activist, as well as the Mayors of Mumbai, Addis Ababa, Panama City, Mexico City, Kingston, Accra, Algiers, and Casablanca. The cities event opening session was moderated by Alexandre Mars, CEO and Founder of Epic Foundation.